Water damage has been a menace to our community since Aurora’s founding in the mid-1800s. 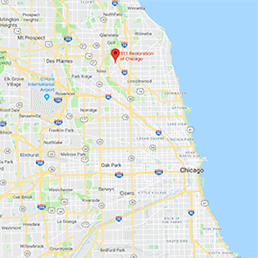 Now, same day service from the water damage Aurora professionals at 911 Restoration of Chicago can save you from the horrors of losing your home to leaks. On average, a person needs water extractions once every 50 years, so there is a high probability a pipe burst or toilet overflow will happen to you sometime in your life. Living on the Fox River increases that probability. Luckily, Aurora has always been ahead of its time, as it’s nickname, “The City of Lights,” shows. Our city was one of the first in the U.S. to implement an all-electric street lighting system. 911 Restoration keeps to that tradition in using the latest drying technology to remedy any floods that you may confront. If your home becomes the victim of floods, we are licensed, insured, and bonded to aid you with all water restoration services and to help residents prevent storm damage, so call our water damage Aurora crew first. How Can I Prevent Storm Damage? You can prevent storm damage by requesting a free inspection from our water damage Aurora specialists because we can show you how to take precautions such as installing sump pumps, cleaning downspouts, and using sand bags. While the Midwest is prone to occasional natural disasters that cannot be stopped, you may be able to avoid rain leaks by simply maintaining your roof’s drainage system. 911 Restoration Aurora is available 24/7 to make sure your gutters are draining correctly and your water removal equipment is working properly. Call our water damage Aurora team before the next major storm so that we can help you mitigate the biggest risks of flooding. The best way for you to remove water from your house is with the aid of our water damage Aurora specialists who have over 35 years of experience in water extractions and sewage backup cleanup. A do-it-yourself job is not recommended for water removal because the liquid can soak into your dry wall causing mold and wood rot. Ruptured hoses on a hot water heater, or a pipe burst due to unisulated plumbing both send water deep into the surrounding area. 911 Restoration Aurora can absorb the excess moisture with the latest drying technology. Unfortunately, home remedies do not complete the job and will leave enough water behind to cause further problems. Call to find out about 911 Restoration of Chicago when you are looking for a water damage Aurora services from the best water removal company. Our water damage Aurora experts make 911 Restoration the best water removal company because we always put the customer first when it comes to floods. We respond within 45 minutes to your water crisis and we are working with all insurance companies so that we can complete your flood clean up fast. In addition, we provide an affordable price and decades of honed expertise, so you know you are getting the best with 911 Restoration. When disaster strikes, call our water damage Aurora experts immediately to stop the spread of destruction; we start pumping water out right away.